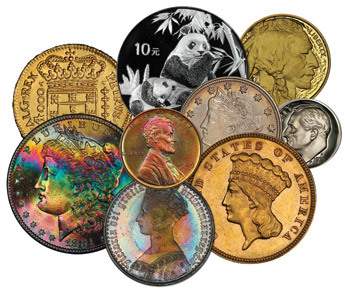 Have you ever inherited a coin collection and wondered how to sell it? Or have you recently become interested in coins either as a collector or investor, and wondered where the best place is to locate and buy some? In both cases, you've probably heard that coin shows have plenty of dealers looking to buy and sell coins. The problem is, you have a lot more questions than answers. And it's true that a major coin and collectibles show like the Long Beach Expo can be a bit overwhelming if you are a novice or have never experienced one before. In this article, we'll try to answer some of the questions that first-timers are most likely to come up with. Q.What can I do prior to coming to the show to help maximize my time and experience once I get there? A.Unless you are just going to soak it all in, you should try to come up with a loose game plan. If you're looking to buy coins, it's good to know what coins you are most interested in and how much money you want to spend. If you are coming to sell coins, there are many ways to go about it, and we'll touch on them here. And by all means study our website to gain as much information as you can and check for discount opportunities. Q.I have some specific items I would like to purchase at the show. Is there a way I can locate the items easily and not have to walk the entire floor in search of them? A.Yes. We have developed an exciting new product called ShowSearch Item Locator. You can use it to narrow your search before you even get to the show! Just type m.collectorscorner.com in your smart phone, choose Long Beach Expo - Coins, punch in the coin you're looking for, view the list, select the one you like best, and go see the dealer. We also have listings for currency, sports cards and stamps that can be found at Long Beach Expo. If you need assistance, go to the CoinSearch booth by the Registration counter. Q.I have a ton of coins to sell. How do I bring them to the show? I want to sell them all. A.If you have hundreds of coins, you'll probably need a table. If this is the case, contact us at 888-743-9316 or [email protected], and we'll discuss the best arrangement for you. What could be better than displaying your inventory and selling it to dealers and public attendees? Sure, you could walk from table to table but if you have a lot of coins it may be difficult and rather cumbersome to successfully shop your inventory around. Q.I really want to come to the show but I can't find a babysitter for my seven-year-old son. Should I bring him along? A.Absolutely! Number one, your son will get in FREE because all kids seven and under are free. We strongly recommend Saturday as the best day for kids. From 11 a.m. - 2 p.m., we have a young numismatist treasure hunt that would be IDEAL for sparking his interest. We partner with other exhibitors to create a treasure hunt all around the coin show floor. Also, the Long Beach Coin Club, Long Beach Stamp Club and an American Numismatic Association-sponsored Young Activities Corner offer educational items and fun for kids throughout the duration of the show. Q.I'm driving a long way to the show. Which is the most active, busiest day? I want to make sure that all the people I normally visit and all the grading services are available. A.Thursday and Friday are the two most active days. We have dealers coming from throughout the United States, Europe and Asia. Unfortunately, we cannot guarantee that all of our dealers will remain at their booths through the end of the show on Saturday. If you have particular dealers and grading services you'd like to visit, we strongly suggest reaching out to them prior to the show to see which days they plan to be there. A.You should check in at the Information Desk just inside the main entrance on your left. Our friendly staff is there to help you. You might want to know which dealers are buying the types of coins you have for sale, which coins some of the dealers specialize in, and where the kids activities are being held. Don't be shy about asking questions about anything related to the show. We'll get you started in the right direction. We also have a directory on the website where you can lookup dealers that specialize in different items and services, click here. Q.My grandma gave me a box full of silver dollars. I'm not sure if I want to sell them or what I should do. Can you give me some guidance? A.Absolutely! The Long Beach Expo is a great place to bring your coins. 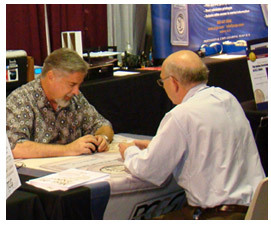 There are free appraisals offered by many dealers on our show floor. If you decide that you'd like to sell, you will see that some dealers have signs that say "Buying." Why not get prices from a few of them so you can compare and get the best price? Q.I'm told that if I do choose to sell and some of my coins are given high appraisals, I should get the high-end ones graded. What can you tell me about this? A.At the Long Beach Expo, you can opt to get your coins graded by one of our grading services. PCGS offers onsite grading. Having your coins graded will increase the likelihood that you will receive fair market value for your coins. Q.I've got about 10 coins I'm looking to sell but I don't feel comfortable carrying them around with me. How can I approach a few dealers about buying my coins without having to take them out? A.Some dealers may insist on seeing the coin before they will quote you a price, but you can certainly try to identify the coin by year, denomination, mintmark and grade, and shop the various dealer tables. Q.Can you give me some advice on how to buy coins at the Expo? A.Sure. First, it's a good idea to know what coin(s) you are looking for, and what you are willing to pay. For example, you may want to buy a Saint-Gaudens $20 gold piece, and you want to look at some in the $3,000-$3,500 price range. You'll find that some of the dealers either specialize in Saint-Gaudens, or have good selections in their cases. Just talk to them, look at some coins and discuss prices. You should definitely make sure any coin you're considering is in a grading service's holder so you know you're getting what you're paying for. Q.I got a $2-off coupon off your website. I've also got one from a newspaper advertisement, plus, I'm a senior citizen. With all those discounts I figure that I owe you $2. Is that right? A.Our $2 off coupon is only good toward general admission. But your senior discount is the best one offered. Admission for seniors is just $4! If we have not covered your question here, please don't hesitate to call us at 888-743-9316 or email [email protected] for further information.